For Vincy Mas 2004 nothing could beat the Soca Monarch competition. It was one of the better shows put on and one can safely say the best. 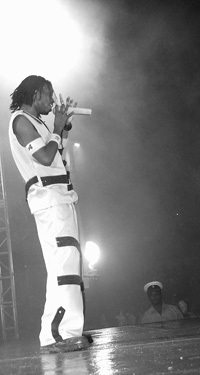 The 20, 000 strong crowd was entertained by the 17 artistes who came up against Maddzart. But this year will be long remembered by Orande âBomaniâ Charles and his magnificent performance. He expressed surprise at the publicâs response to his song. From the area of Campden Park, just north west of capital city Kingstown, Bomani has been in and around the music scene for the past five years. He admitted that he did not write the song for Soca Monarch, but once the public got hold of it, they took over and the rest is part of this countryâs carnival history. Bomani took the Soca monarch title with his âI am Soca.â He beat former Soca monarch Cornelius âPoorsahâ Williams into second with his âLa Jabless,â and relegated last yearâs Soca monarch Raeon âMadzartâ Primus with âRoad Soldiersâ to third. Fourth spot was taken by Alla G with Dugu Dugu. Once Bomani was announced Soca Monarch, it was no stopping for him. And his song simply grew onto listeners and revellers alike. Bomani swept to the Road March title with his âI am Soca,â with Poorsah, looking to do the beaver trick of road marches, again in second spot with his Jabless. Fire Man Hooper made his stake at the crown with âCarnival Register,â putting on a performance portraying a Caribbean Kingdom and he being the King. It was at that stage that patrons broke a section of the barrier near to the stage. However, it was when Icon appeared with âWe Donât Careâ that chaos broke out. Dozens of fans ran onto the area, stamped so hard and smashed it. The organizers halted the show, preventing a complete destruction of the stage, but the damage had been done.It took approximately half and hour to get the stage ready again. Shaunelle warmed the crowd with âIs Only Love.â Madzartâs dramatization of âRoad Soldiersâ saw a clip with television newscaster Jennifer Richardson delivering breaking news that international superstar Maddzart was missing in action in the Middle East. The clip also showed several of his fans. While those at Victoria Park looked for Maddzart from the side of the stage, Maddzart appeared out of a hole in the centre of the stage, which sent fans wild with exuberation. In the end, Bomani, a member of the band HS PHAKTOR, endeared himself to the audience. He will collect EC$15, 000 for his performance, and another $3,000 for the Road March. Poorsah wil get EC$9,000, Maddzart EC$6, 000 and Alla-G EC$4,000.